Your business deserves a clean carpet. Your Louisville employees and customers deserve a healthy carpet. Kentuckiana Carpet and Upholstery Cleaning LLC's commercial carpet cleaning in Louisville, Kentucky gives you what you want and your business needs. Did you know your carpet in your office building serves as a giant air filter? That is carpeting's main job, and it does it very well. Carpeted surfaces trap airborne particles, making the indoor air cleaner. But filters can only hold so much debris before they stop working. At that point, walking across dirty carpet actually releases trapped particles, making them airborne. That is why regular vacuuming and periodic professional carpet cleaning in Louisville is important to the health of your building. If you can tell that your carpets in Louisville need professional cleaning, your employees and guests can see it too. You might already have it on your to-do list. It doesn't have to break the budget, either. Don't procrastinate any longer. Just pick up the phone and make an appointment for a free estimate by calling (502) 935-2205. Clean office carpets in Louisville would make many people happy! Save money by paying a contractor for commercial carpet cleaning in Louisville? Yes, it's true, and for several reasons! First, customers vote with their dollars and they would rather visit an establishment that is clean. Successful businesses are clean businesses. Second, clean carpets work as great filters to remove particles from the air and improve indoor air quality. A healthy work environment promotes a happier and more productive work environment. Lastly, sand and dirt and general grit that become trapped in carpet damages the fibers just like sandpaper would. The result is frayed fibers and a prematurely worn carpet that will become a significant expense sooner rather than later. Protect your business. 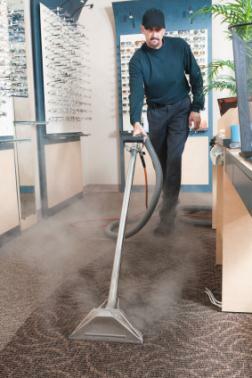 Vacuum that carpet daily and regularly steam clean your Louisville commercial carpets. 5★★★★★ - "AMAZING! Totally shocked that my carpets look as good as they do. Never thought they would look this clean again. I really didn't think anyone could get the stains out. Thank you Kentuckiana, you surpassed all my expectations! ! You are my carpet cleaning hero!" 5★★★★★ - "I really had some carpets that I was wondering if I was just wasting my time trying to get them cleaned this company is a miracle worker I'm a person with five kids age from 4 to 12 so people can only imagine so thank you Kentuckiana Carpet"
5★★★★★ - " They came in started working immediately and did a good job. They did not try to sell me something other than what I had hired them to do. " 5★★★★★ - " The person that came to our home was polite and careful. I am very pleased with the service I received. The stains, unfortunately, came back and I called to inform them, they said no problem and came back out to re-clean those areas. Thank you for the great service. " 5★★★★★ - " Shaun Sr did a great job, was on time, professional and went above and beyond. Warned my kids several times about being careful due to the wet floors. " 5★★★★★ - " If you make my wife happy with the results from the carpet cleaning that is more than I could ask for. She was very pleased! " 5★★★★★ - " Professional, did a great job. " 5★★★★★ - " They were in and out pretty quick. Great job. " 5★★★★★ - " They were on-time and worked quickly. We've never had our carpet cleaned, but they assisted us with the process every step of the way. Plus, their prices are better than the competition by far!! " 5★★★★★ - " The staff was very friendly and very professional. " 5★★★★★ - "Mike McCoy was very professional and timely - great job, and will definitely use again." 5★★★★★ - "Jason was very friendly and very professional he did an excellent job on spots that very bad. I would highly recommend this company and particularly Jason to my friends." 5★★★★★ - " Over the years I have used three (3) different companies for carpet cleaning, but none has come up to Kentuckiana...They did a fantastic job!!!! Highly recommended !!!!!!!!!!!!!!!! " 5★★★★★ - " We were very pleased with every aspect of the job. " 5★★★★★ - " Kentuckiana Carpet Cleaning is always professional and always does a fabulous job on my floors! Wouldn't use anyone else, not even with a groupon! " 5★★★★★ - " Fast friendly service and well done. " 5★★★★★ - " On time, efficient, and thorough. " 5★★★★★ - " I am very satisfied with the results. I will recommend you to all my friends and family. " 5★★★★★ - "Wow is all I can say! The price I paid was more then worth the time & effort Jason put into my house. You seriously can't go wrong here :)"
5★★★★★ - " Got off to a bad start due to a mix up with the appointment, but the owner called me and rescheduled my appointment. The guy that came out and did a FANTASTIC job. He was very polite and helpful. I was extremely happy with this company! I would certainly recommend and I will certainly use again! " 5★★★★★ - " Good quality service -- The guys really know what they're doing. Jason (in the office) was very easy to work with -- Definitely hire them again! " 5★★★★★ - " Very friendly, fast, and carpet looks great! " 5★★★★★ - " He was professional and did a great job! " 5★★★★★ - "Very nice and experienced workman. Has same feelings I have--I'll give you my money for a good job --just don't try to steal it from me. He did a fast and very good job. I highly recommend this company for all of Oldham and LaGrange people that need the services of this company!!!" 5★★★★★ - " Our carpets were really dirty from the dogs tracking in and out and we tried to clean them ourselves with a rug doctor but it just didn't do the job. Kentuckiana Carpet came in and did our carpet and our stairs and did and excellent job. Very professional and polite staff. We will be using them again in the future!! " 5★★★★★ - " The technician showed up to my house on time and he was very nice. He explained the process, went over the options I had chosen, and worked quickly and efficiently. There were no stains left in the carpet once he was done and he even gave me tips on how to correct carpet indentions from the furniture. I would definitely recommend this company. " 5★★★★★ - "They came when they said they would and did a very professional job I would use them again." 5★★★★★ - " THEY DID A EXCELLENT JOB. " 5★★★★★ - " Called prior to arriving, appreciated that. Was willing to redo an area that needed to be redone before leaving. A pleasure to work with. "